She started off anonymously, but as Jamie Watts kept going, more and more people noticed what she was achieving. That’s what she thought, back when she first started running in 2012. With a simple goal of getting herself in shape, Watts began running on a treadmill at her gym several times a week, but she never intended to run in public. Disabled since birth with cerebral palsy, Watts’ gait is different than most. She runs on the treadmill independently, but uses a cane to compete in all of her races. Like any runner, Watts has to take extra care on rough or steep terrain, but she views it as just a part of her overall strategy when completing a race. Disability does not limit Jamie’s spirit, or her ambitions. Six months after she began a concerted effort in running, Watts decided to register for her first public race, the Marine Corps Gender Defender 5k in Quantico, Va. “I thought I’d start with the Marines – and they’re intense,” she said. Though she was so sore after the race she could barely stand, she loved every minute of it. She was soon racing regularly, about seven races per year. On April 25, 2015, three years after beginning her journey, and dozens of races later, Watts crossed the finish line of her longest race yet, the Pacers George Washington Parkway Classic, with a time of 6 hours, 32 minutes, and 12 seconds for 10 miles. The race represented the accomplishment of a significant milestone for Watts: her 34th race completed over the course of a year, a goal she set out to complete last June to commemorate her upcoming 34th birthday on June 13. The journey to get to the finish line of a 10 mile race began when Watts met Stacy Sanders, a Pacers race staffer, at a 5k race last June. Watts mentioned to Sanders her tentative goal of finishing 34 races, but also her concerns that it would be too logistically challenging to complete. “Living in DC, we have lots of races, but some are in cold or bad weather. What if I fall, or what if they can’t keep the roads closed long enough for me to finish?” she worried. Rainy or icy conditions, rough terrain, and downhills all present challenges for Watts due to her disability. Sanders responded that Pacers would do whatever it took for her to meet her goal. After talking with Sanders, Watts’s first Pacers race was the Freedom Four Miler, a race that finishes on a tough uphill course, on what happened to be an extremely humid day last June. “I’m used to finishing when no one is around, but that day, there was a huge crowd of people when I finished,” Watts said. Finishing with the crowd meant Pacers had to accommodate an earlier start time for Watts on all races – sometimes 30 minutes to one hour. On the day of the 10 miler, Watts lined up to the starting line at 6 a.m., a full two hours earlier than the rest of the participants. As she continued onward towards her goal throughout this past year, Watts would research and plan her races about a month in advance, but then often added additional ones at the last minute when her friends invited her to try out new events. This meant she would sometime race twice in one day, or twice in one weekend. In addition to the early start time, Pacers also designated an assigned volunteer to run with Watts during every race. “That wasn’t something I asked for, but it’s something they came up with as a best practice,” Watts said. “Lisa knows I’m a strong runner, but she wants to make sure I’m fully supported just like everyone else.” Watts and Reeves chat before every race to make sure all details are in place. Of all her races, Watts is most proud of completing the 10 miler. “I knew I had the first 10k down, but I needed my friends to get me through the rest,” she said. Watts’ enthusiasm, upbeat attitude, and positive outlook have made an impression on many. 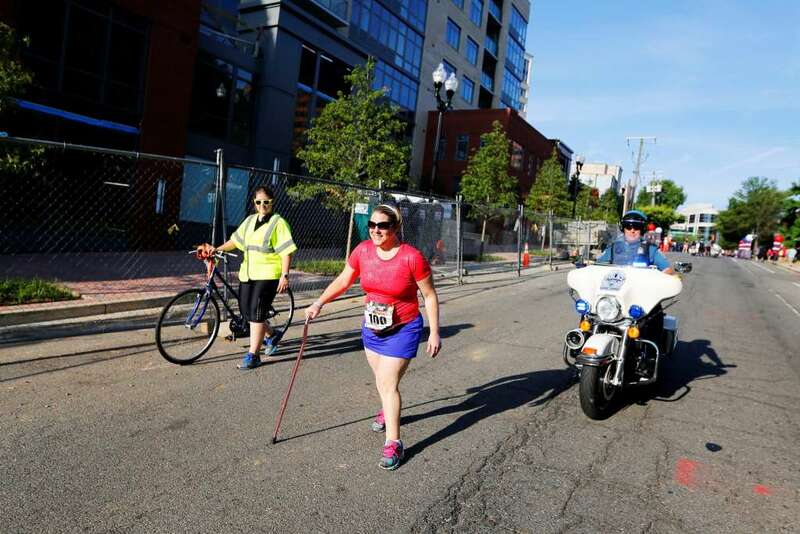 In addition to her training, where she keeps a consistent schedule of four miles a day, five days a week, Watts works at an organization supporting individuals with disabilities. She also loves attending concerts and spending time with friends. Throughout it all, she has maintained her love of racing. She has no plans to take a break, now that her 34 race challenge is complete. Her next race is the Marine Corps Historic 10k on May 17, and she is already preparing for the two killer hills on the course. Reeves has no doubts she can do it. “There are no limits on what a person can do, and she is a true example of that,” she said.